There is lots and lots of great stuff going on in the world and my posts to date (which I hope you have found inspiring) have barely touched the tip of the iceberg showcasing the variety of ways in which the Sustainable Development Goals are being tackled at the grassroots level. But despite that, I’m going to change tracks with this post. And it’s because of something I read after the US election. I couldn’t ignore the headline: What if Dr. Seuss had been alive for this election; perhaps he would have written The Grump Who Sacked Greatland. It has the rhyming rhythm of Dr. Seuss stories and the made-up words and the humour (a little dark in this case). But importantly, the author uses that very Dr. Seuss way of taking a super serious issue and distilling it into a very simple life lesson. That was the brilliance of Dr. Seuss. So, while it’s inspiring to read about what other people are doing to make the world a better place, we can also be inspired to do our own bit by the simple story-telling of a great author like Dr. Seuss. He had a unique talent of taking the big issues like environmental destruction (The Lorax), discrimination (The Sneetches), kindness and consideration (Horton Hears a Who) and delivering a super important life lesson in the guise of a slightly absurd but highly entertaining story. My favourite Dr. Seuss story is definitely The Lorax. If you care about nature and are maybe a bit concerned about whether or not we are mortgaging the health of our planet for short term economic gain (wow that sounds so heavy!!!) read about the truffula trees and the endearing brown Bar-ba-loots in Dr. Seuss’s The Lorax. Or if you are concerned at all about discrimination and the rise of populism, The Sneetches is a wonderful analogy for the ridiculousness of judging others based on skin colour or attire (“or stars upon thars….”). But of course, one of the most famous, and just in time for the holiday season, is The Grinch Who Stole Christmas. Poor Grinch, so lonely and sad, who learned that it’s not the gifts and the decorations that make Christmas — Christmas comes “..without packages boxes or bags”. It’s about sharing time with family and friends and opening up our hearts up to the ‘grinches’ in our lives. We might just find that when we do that our hearts grows ‘three times larger’. Dr. Seuss lived and wrote long before the creation of the UN Sustainable Development Goals, but his storytelling continues to inspire readers young and old about how we can all be better, more caring and decent human beings and surely that is an over-riding objective of the SDGs. 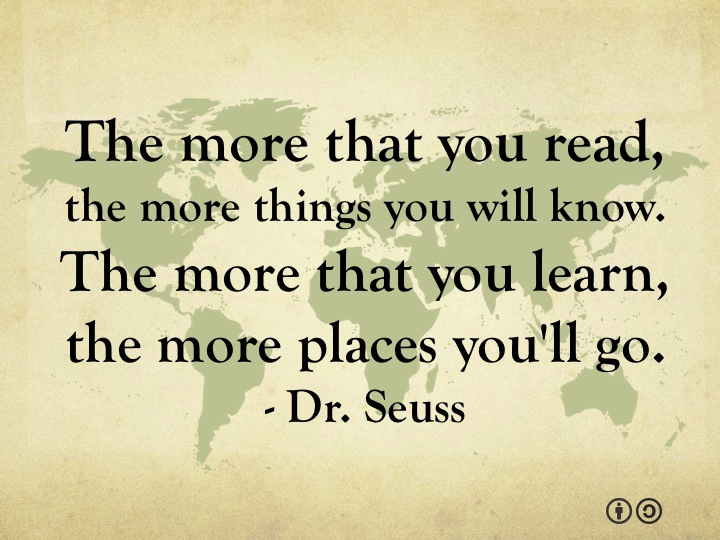 I love Dr. Seuss and now you’ve inspired me to go back and re-read his awesome books. Such a lovely post….thank you for the memories and new inspriation. great post! love the connection!